This year’s Chelsea Flower Show took place between the 22nd and 26th May 2018. As always it was popular with 1,000s of people of all ages who were not only looking for a great day out, but also some inspiration for their own back yard. This year at Chelsea there were so many gardens showcasing the latest trends that can easily be replicated at home. 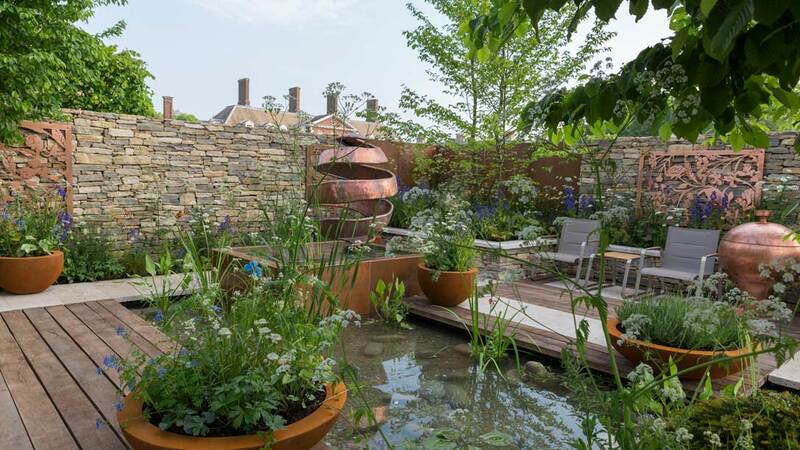 Water was a huge theme at this year’s Chelsea Show with many gardens making water the central feature. To be honest, it’s really not a bad idea, imagine coming home after a hard day to the soothing sound of trickling water – is there anything more relaxing. David Neale’s Silent Pool Gin Garden is the perfect example of how water and traditional garden concepts can work hand in hand. His perfectly sculpted landscape of beautiful stone paths, dark oak and soothing tones of blue, white and copper, create a truly calming ambience. 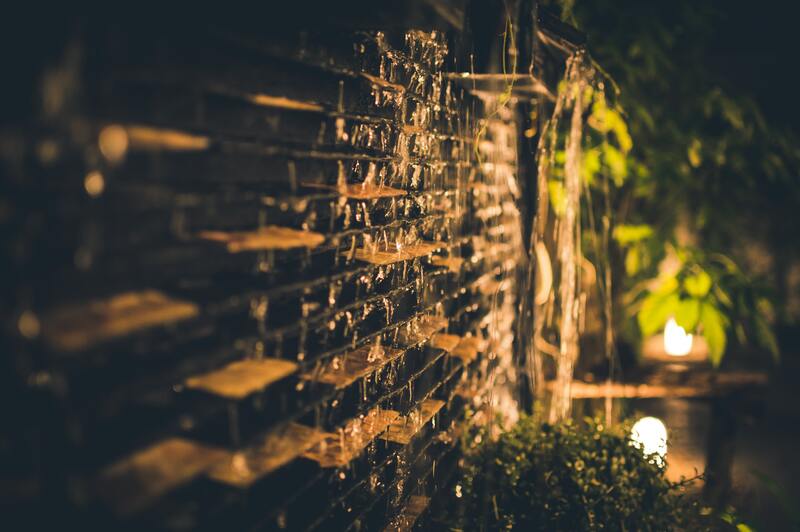 Primrose offers a huge range of stunning water features covering all tastes from traditional to very contemporary – the perfect choice if you’re thinking of adding a central water feature to your garden. 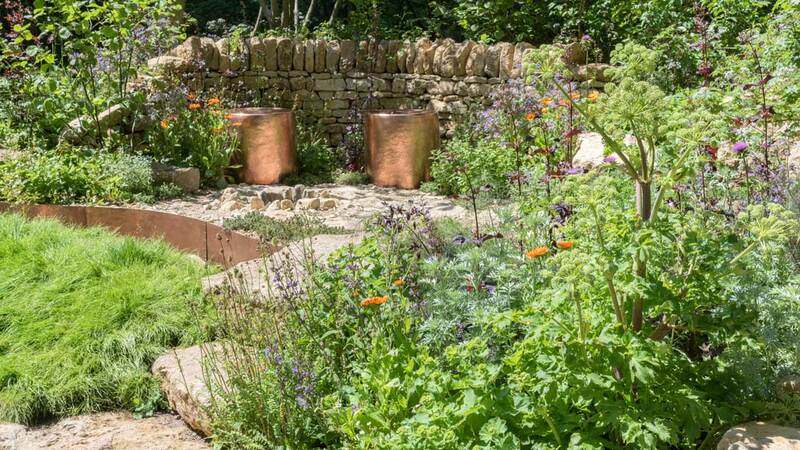 The Warner Edwards Garden, created by Kate Savill and Tamara Bridge, makes herbal and medicinal plants the stars of the show. This garden proves that these plants are not only great in the kitchen but they add height, depth and colour to a garden too. The garden incorporates plants loved by the nation’s favourite pollinators and even includes a small bowl for them to drink from. The plants and natural materials they’ve chosen to include not only build up a beautiful landscape but they also encourage nature’s finest creatures into your garden. Think white stone, beautiful benches and pristine landscaping. Think ‘gardens of a stately home’ and you’ll be well on your way to envisaging a beautifully romantic garden. Janine Crimmins’ A Very English Garden, on display at Chelsea, is the perfect example. 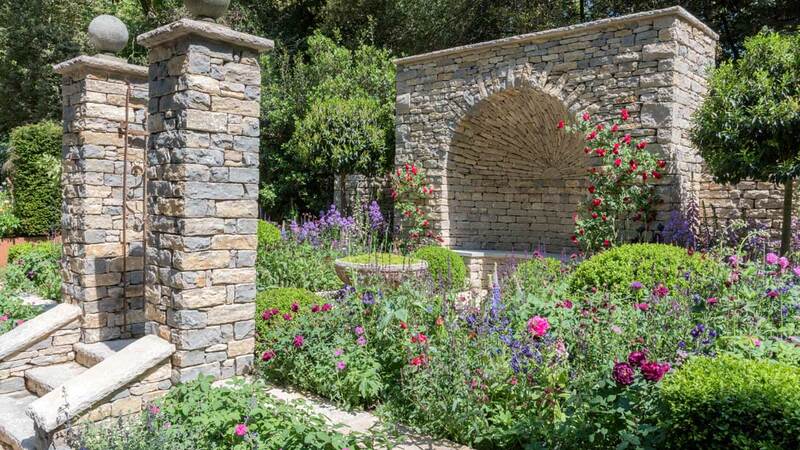 Janine opted for a more traditional style in her garden with drystone walling, the Tuscany Superb old rose and other more old fashioned plants like geraniums and salvias. Naomi Ferrett-Cohen created a perfectly simple garden which still wowed the crowds at Chelsea. 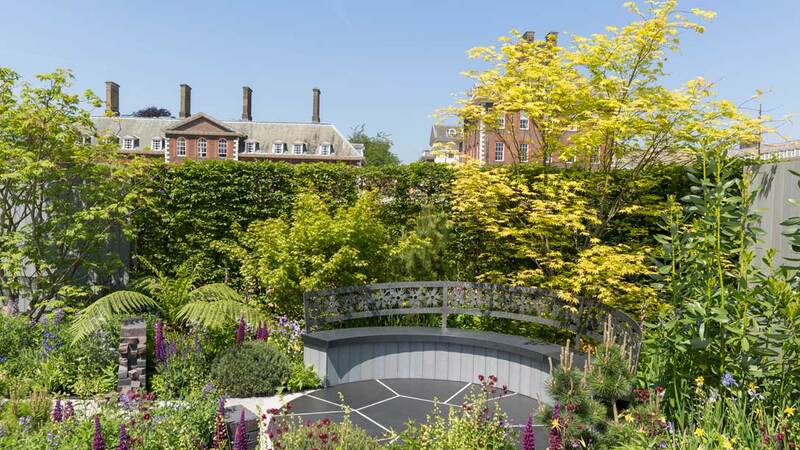 The Cherub HIV: A Life Without Walls garden, is a low maintenance composition of dwarf conifers – Low Glow and Nana – to provide height, along with a selection of ground covering plants including Euonymus fortunei and epimediums. This garden works of the concept that the shape and texture of the leaves is enough to garner interest throughout the year. 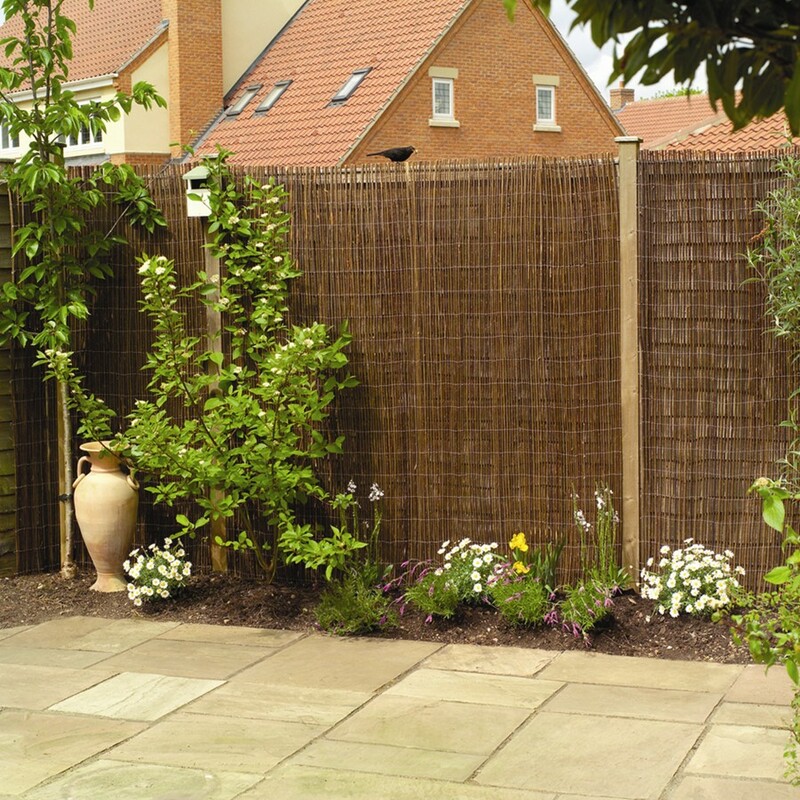 Using repetition of a limited palette of low maintenance plants you can still create an award-winning garden – just one you’ll find it much easier to maintain! So that’s four key trends of this year’s Chelsea Flower Show, please share your attempts with us on Facebook or Twitter. We’d love to see your recreated Chelsea at home looks. Also look out for our next post, it’ll detail the remaining must visit RHS flower shows and events throughout the year.